Ripping out my bathroom means that I need to find things to put BACK into the bathroom if I ever expect to use it again. Let me just state for the record that I have ZERO design skills…I can’t even match a pair of pants to a shirt unless it is jeans and a Tshirt. Choosing patterns, colors, and accessories for this bathroom remodel may just kill me! In fact, the entire bathroom remodel may be enough to send me over the edge of sanity completely. I am making myself a list of things to do as I tackle this bathroom remodel and I figured I would share it with you in case this is on your ‘to do list’ for the coming year. The Bathroom Remodel I WANT but can’t AFFORD! 1. Set a budget: We have an account that we use primarily as a savings for home remodeling. There are a LOT of things that need to get done in this house so we save up, do one, then start saving again for the next one. Some of those chores are huge (new windows cost us $12k!) and others are much smaller (one room of wood floors was $2K). Whatever your budget is for your bathroom remodel, try not to take out a loan for it if you don’t have to. Unless you have a remodeling emergency you should save up for it a little at a time. You can often negotiate a better price if you are paying cash rather than getting a loan. 2. Do your research before hiring someone: There are a few really unscrupulous people out there just looking to screw you out of some money. Many will just abandon ship half way through your bathroom remodel and leave you with no money and no working toilet. We got a recommendation from a neighbor who has been using the same guy for years. Personal recommendations go a long way towards ensuring that you are working with someone ethical. 3. Don’t rush into things! Take your time to visit showrooms, flip through magazines, look at online ‘lookbooks’ and browse the home improvement stores. Bring paint samples from one place to the tile place and look at them next to each other. You only want to have to go through this bathroom remodel process once! NOTE: This is the part that is KILLING me! I am horrible at these things! Someone needs to revoke my girl card because I cannot design anything to save my life! I have been spending most of my time on Houzz.com in hopes of coming across I bathroom photo I love. Then I can just take that photo to random places and say “Make me THIS bathroom!” What do you think of this one? 4. Realize that a bathroom remodel takes a few weeks: That means you will NOT be using that bathroom until things are back in place. Thankfully we have another bathroom so this bathroom remodel won’t be TOO horrible to deal with. Although you try sharing a bathroom with two teenagers and see how quickly you start to edge to the other side of sanity. They have more hair crap between the two of them than some beauty salons! 5. Ensure you NEVER have to do this again! Make every single decision of your bathroom remodel project with the intention that it will be the last time you ever do this. 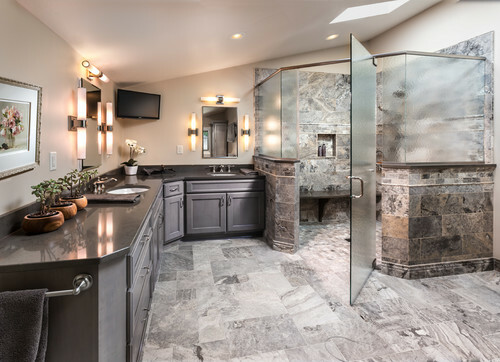 A bathroom remodel is not cheap but it is one of the first things that sell a house to prospective buyers. You don’t want to install pink toilets and strobe lights now only to have to go through yet another bathroom remodel because your bathroom is too dated to sell your house easily. Paint and decorations can be replaced easily. Tile and vanities and toilets cannot! As I go through this bathroom remodel I will try to keep you updated on the process. There will definitely be a few bottles of wine in my life this month as I try and deal with the added stress of a bathroom remodel along with everything else. Maybe a glass or two of wine would make it easier to pick tiles and colors? I need to get right on that! 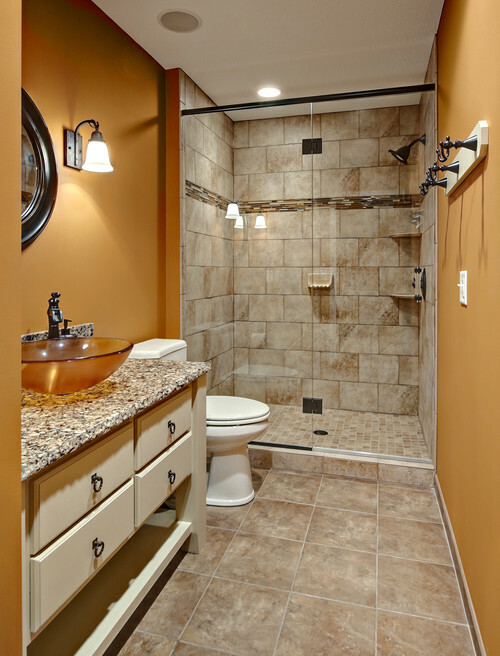 Have you ever been through a bathroom remodel? Any tips for surviving the process?